Brooks Road Environmental (formerly known as Edwards Landfill) is a sustainable landfill operating in the GTA and Southwestern Ontario. We have the ability to meet the waste disposal needs with our commitment to protect the environment. We specialize in the disposal of contaminated soil, asbestos, hydrocarbons and construction or demolition material. Conveniently located off the 403 and highway 6 South, we are fully licensed and approved (MOE certificate A110302).Call us today at 416-966-1100 or visit our website at <a rel="nofollow" target="_blank" href="http://www.brenvironmental.com">http://www.brenvironmental.com</a> for your waste disposal needs. Magic Touch Home Services Inc. Magic Touch is a premier service provider of chimney and dryer vent maintenance in the Greater Toronto Area. Founded in 1990, we started our operation as a home-based business. Right then, our services were mostly limited within cleaning chimneys and installing chimney caps in Toronto and surrounding areas. However, with time, we have extended our services and at present we offer a quite a good number of installation apart from the chimneys. Our Team: We are committed to provide you the best services in terms of quality as well quantity. We appoint a team of expert professionals who are highly qualified in this field. They carry out a detailed survey of the product before installing it. In addition to that, we offer excellent customer service. To keep our employees up-to-date with the latest industry trends, we provide them the required training and education. Our employees are adept in handling latest equipment. At present, we are the largest chimney and dryer vent service companies in the greater Toronto area. The potential base of loyal, satisfied customers has made us the industry leader. Junk It provides professional services across Southern Ontario at affordable rates, including junk and garbage removal, dumpster and bin rentals and more. Over 10 years of experience providing professional junk removal, trash removal, as well as bin and dumpster rental services in Toronto and surrounding area. 1hrjunk provide quick, clean, efficient and affordable junk removal services for both business and residential clients. We can haul away just about everything, including furniture, appliances, and construction debris. Call us for same day service, and will always arrive within a 1 hour window! Our staff are kind, courteous and respectful, and will always make sure to clean up after themselves. Call us for a free quote at 416-554-4321! Mention that you found us on houzz.com and receive 10% off! We also recycle and donate everything we can! 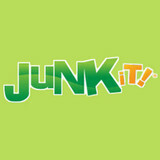 Check out our website at 1hrjunk.com for more information, and call us for a free quote! Bin There Dump That is a bin rental company that provides residential friendly bin rental services for homeowners and business looking to get rid of unwanted junk and trash that have piled around the home or office. We have a variety of dumpster sizes so we can accommodate any size job and we also work with construction crews to provide construction dumpster rentals. ECF specialises in exterior demolition, excavation, and site remediation. We are licensed and WHMIS insured and we have over 25 years of experience in these fields. We pride ourself off of completing each job with efficiency and precision while offering customers a cheaper alternative to demolition and excavation jobs. We are on a mission to enable the fastest and best priced junk removal services, while empowering the everyday entrepreneur. We are focusing on helping businesses. Some examples of our customers: property managers, self storage facilities, contractors, renovators, etc. We are the only fully digital order to payment junk removal company. Shorncliffe Disposal Services is a Waste Management Company, located at 51 Shorncliffe Rd. just off of HWY 427 & Dundas. Our yard has a Waste Transfer Station which is open to all professionals as well as the public. We cater to all businesses/companies, tradesmen and homeowners who require a site to bring their waste and debris. We also offer a Bin Rental Service with competitive rates for various sizes. 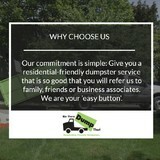 Bin There Dump That is North America's residential-friendly choice for dumpster rental service. We provide homeowners and contractors a simple and easy waste disposal solution at their homes or job sites. At NuGround, our goal is to provide freedom and peace of mind to homeowners by offering them reliable, high-quality services and outstanding customer care. Those services include small moving, junk removal & secure storage. As service providers, we value hard work, customer service, and professionalism. Our team is highly capable and well-trained. All individuals wear uniforms and our vehicles are properly branded. We care deeply about our community. We love our town, our province and we are proudly Canadian. Our mission is to provide quality jobs and careers to Canadians while at the same time doing what we can to help out our environment by implementing eco-friendly practices. I help people who are going through life transitions such as downsizing or upsizing. I also help relatives go through estates and clear the space for sale or to vacate. Busy families can also be helped with my organizing and decluttering services. Fast, Friendly, and Affordable Toronto Junk Removal Service. Call Us Today For Your Free Estimate. Single Item Pick-ups Starting at $40 and up. IF YOU'VE GOT JUNK YOU DON'T LIFT A FINGER! 1-800-RID-OF-IT JUNK REMOVAL TORONTO PICKS IT UP EXACTLY WHERE IT SITS. Why waste time and energy collecting, organizing and moving items to the curb or loading dock? 1-800-RID-OF-IT Junk Removal Toronto goes where your junk is, be it upstairs/downstairs, head office/warehouse, indoors or outdoors. Our rates are extremely competitive: just enter your info into our Price Estimator at left to see for yourself. If you've got junk, ridding your home or business of it has never been easier! We provide prompt, reliable junk removal, disposal, and recycling service across the GTA (bin placement and bin disposal are also available!) Your time is important, so we guarantee a pickup time that is convenient for you. Book a time online using the Price Estimator, or give us a call right now. We'd love to hear from you! Every part of a home has its own story. It can be seen by the features of the home and its design. It would be such a shame if everything will be covered in snow. Our services include residential snow removal in Toronto. Through this, every home will be seen with its beauty and will be made safe for everyone. For everyone in Toronto, snow plowing will not be that difficult to do. Just give us a call and we’ll give you the service that you need. There are full-service junk removal companies in Oakville, ON that help with everything from clutter and hoarding cleanups to appliance recycling to donating unwanted items. Keep in mind that you may need professional help removing certain items from your home, particularly if they’re toxic or unstable. Here are some related professionals and vendors to complement the work of junk removal: Tree Services, Environmental Services & Restoration, General Contractors, Home Builders, Landscape Contractors. Find rubbish removal professionals on Houzz. Narrow your search by city or zip code for a list of Oakville, ON rubbish removal services. Get contact information so you can ask about rates, and read customer reviews to find the best rubbish and trash removal service for your home improvement project.